Welcome to Faculty of Food Science and Biotechnology! Postgraduate Study Centre of Quality Management in Food Production. According to the resolution, the units functioning as a part of the Faculty of Agriculture till 31 December 2005 (the Division of Food Technology and Nutrition, which was closed, the Chair of Chemistry and the Chair of Biochemistry and Food Chemistry) were moved to the Faculty of Food Sciences and Biotechnology. The time between 1 July 2005 and 31 December 2005 was devoted to organizing the Faculty. At that time an electoral commission, which held the election of electors from groups of employees not being independent academic lecturers as well as the election of Faculty Council representatives was established. The election of student representatives and student electors was held by the student government. The Dean and Vice-Deans of the Faculty of Food and Biotechnology were elected in December. In October 2006 the units moved to the Faculty (except the Chair of Chemistry) were transferred to the newly erected building at 8 Skromna Street. 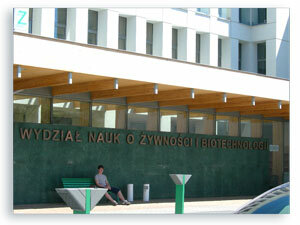 On 1 January 2006 the Faculty started functioning as the sixth Faculty of the Agricultural University of Lublin. The majority of independent faculty employees became members of the Board established at the Faculty of Agriculture to conduct doctoral defences in food and nutrition technology, as since 25 February 2002 the Faculty has been entitled to grant doctor's degree in the field of food and nutrition. Since then the Faculty Council of the Faculty of Agriculture has granted 19 doctor of agricultural sciences degrees in food technology and nutrition. Currently the Faculty of Food Sciences and Biotechnology is entitled to grant the title. The Central Commission for Academic Degrees and Titles, after consultation with the Council for Higher Education, decided to grant, on 26 June 2006, the right to award the academic degree of doctor of agricultural sciences in the discipline of food and nutrition technology.